Mega Sale! Save 27% on the Pantry Elements Silicone Baking Cups Variety Pack/Bento Bundle Lunch Box Dividers (18-Pack) by Pantry Elements at Baking Love. MPN: FBA_PE-SBC-BB-V18. Hurry! Limited time offer. Offer valid only while supplies last. PERFECT FOR PREPARING YOUR BENTO LUNCH BOX- This 18-pack of silicone easy-release, reusable, cupcake, muffin and mini loaf pan cups are so versatile. 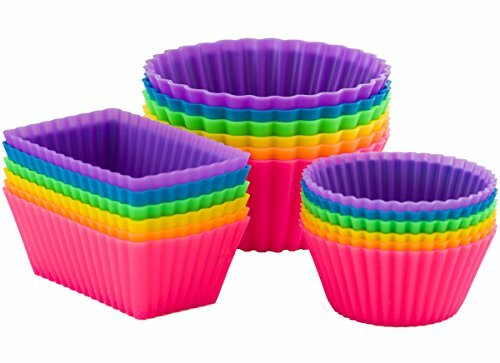 - This 18-pack of silicone easy-release, reusable, cupcake, muffin and mini loaf pan cups are so versatile. - This is the perfect set for preparing a bento lunch box. - Also great for baking. Just place the baking cups directly on a baking sheet and place in the oven. YOU'LL LOVE THE FUN COLORS - KIDS LOVE 'EM TOO! desserts, and frozen treats such as mini ice cream cakes, ice cream molds, fruit and snack bowls! - Securely place in the top rack of the dishwasher or hand wash to clean. - Stack and store in their box for reuse. Backed by a Lifetime Free Replacement Guarantee. Click the "Add to Cart" button at the top of this page to purchase your Silicone Baking Cups/Bento Bundle now! MAKES LUNCH IRRESISTIBLE - Pantry Elements Silicone Cupcake Liners Combo Pack make eating fun by separating in a colorful way the veggies, snacks and fruits in a kid's bento lunchbox. Pack a nutritious meal and avoid the processed food rut. Picky eaters love eating healthy meals using these bright, vibrant, rainbow colors! MIX AND MATCH TO SAVE: For a LIMITED time, save with your purchase of two or more sets! See "Special Offers and Product Promotions" below. PREMIUM QUALITY YOU CAN TRUST - Our sturdy but flexible, eco-friendly, easy-release, non-stick cake molds are BPA free, PVC free and phthalate free, and are made from the HIGHEST performance, 100% pure, food-grade silicone meeting stringent U.S. FDA and European LFGB food safety standards to safeguard your family's health! No chemical coatings, no fillers, pinch test passed! Guaranteed. Replace your larger muffin tray, pan or tin with our environmentally safe, space-saving alternative. SPECIFICATIONS AND DIMENSIONS - Each set is comprised of 18 liners total (six Standard, six Jumbo, and six Rectangular) in six fun, vibrant colors (pink, orange, yellow, green, blue and purple), packaged in a durable storage box. The Jumbo round cups are 3-5/8 in. dia. x 1.7 tall; the Standard round cups are 2.7 in. dia. x 1.25 in. tall; and the Rectangular cups are 3-1/4 in. long x 2-1/8 in. wide x 1-1/4 in. tall. Microwave, oven, refrigerator, freezer and dishwasher safe from -40 F to 500 F.
MULTIPURPOSE VERSATILITY - Besides their use as bento box accessories, they are fantastic for baking breads, small loafs, muffins, cupcakes, candy making and preparing meat dishes, eggs, treats, desserts and candy making. Perfect for sorting small items. They even work fantastic in air fryers. They feature our OptiBake technology to ensure optimum baking performance. Imagine this space saver in your kitchen baking supplies pantry! Great for a birthday and holiday party! LIFETIME SATISFACTION GUARANTEE - If for any reason you are not satisfied with this product, return it for replacement or refund. Pantry Elements is a Registered Trademark of Veriture, Inc. and is exclusively distributed by Veriture, Inc. If you have any questions about this product by Pantry Elements, contact us by completing and submitting the form below. If you are looking for a specif part number, please include it with your message.